If you are like me, you hate to weave in a bunch of ends of yarn when you are done your crochet project. Normally there is at least a beginning and ending piece of yarn that you have to weave in. But there can also be other strands of yarn from when you change colors or have to cut and attach your yarn at a new position in your work. The number of ends you have to weave in can add up. Here is a simple tip that can help you reduce the number of ends you have to weave in at the end of your project. In the example in the photos, I am changing colors, and have an end that I need to tuck into the work. This method can also be used for other situations as well! Then crochet as you normally would, but over the strand of yarn. This way, you are hiding the yarn that you would normally have to tuck in later. See, you can’t even see the end that was crocheted over! This is the same idea as carrying your yarn when you change colors in crochet. You can use this method anytime you are crochet over an area that is close to where your strand of yarn is sticking out of. 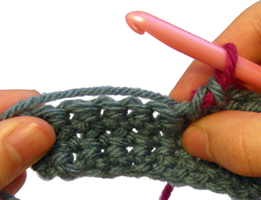 Such as if you are crocheting a border, you can hold the ends of the yarn along the sides while crocheting the border over them. This entry was posted on Thursday, November 12th, 2009 at 1:47 AM by Rachel Choi	and is filed under Tutorials and Help. You can follow any responses to this entry through the RSS 2.0 feed. You can leave a response, or trackback from your own site. I just wanted to say how much I’ve been enjoying your blog since I found it a few weeks ago. :o) There don’t seem to be many crochet blogs out there right now (or maybe I just haven’t been looking hard enough), and they are such a help and inspiration to those of us who are still learning. I *love* this technique! Thanks so much for this post, I’ll be linking. It’s funny. Just this morning I was wondering if there was a way to do that and ended up doing the same. Kinda glad there’s someone out there who hates weaving in the ends as much as I do, lol. This is a great tip! But my problem is that I’ve tried this and for some reason, when I wash the item I’ve made, I find that the ends start to stick out and I weave them back in. Is there something I’m doing wrong?? How else can I secure the end piece and keep it from peeking out after washing?? Hi Maria, this technique works best when your stitches are tight. That way the stitches can hold the loose ends tighter. You can read more about other techniques here: Finish Off and Weave in Ends in Crochet If your ends are sticking out after you wash it, you can try hand washing instead of using a machine, so it won’t be as rough on the material. Wow – Your tutorials are the easiest to understand I’ve found anywhere! Thank you so much for sharing with the rest of us! G.L. I HATE HATE HATE weaving in my ends! I almost don’t want to finish my projects because I know I’ll have to do this! I tried this the other day on a project, and it was so much easier than weaving them in! One question – do you tie the 2 yarns ends together before you weave them in or not? I’m just wondering if they’re not tied together if the project will start to pull apart after time. Hi Rachel, I don’t tie the ends. My projects seem to hold up without doing it. But if you feel you need to you can. What about projects such as hand-towels or washcloths that will eventually be put into a washing machine? I hate simply “weaving in the ends” of yarn because I’m afraid they’ll eventually work their way out. I usually fall back to tying a double-knot so that it doesn’t come out, but who likes the look of “knots” in their crocheted masterpieces? Unless it’s something that has an “inside” that won’t be seen (such as a mitten or something), knots are next to impossible to “hide.” Any suggestions? Hey Heather, if your stitches are tight it should be fine. I’ve done a washcloth in single crochet that gets used and washed a lot and the end hasn’t come out yet. But if it’s a pattern with loose stitches I would make small (not visible) knots just to be on the safe side. Play around with it and have fun! This sounds like an awesome tip. one quick question about it. In your example you changed from green to pink. do you crochet over the new color’s end as well, so in your example you hold both the green and pink together while you crochet over them both? In your example it looked as though you didn’t crochet over the pink one, and i was just wondering if you crochet over them both or not? If not than do you weave in the pink later? Hi Andrea, you can do either way. Sometimes it can be a little too bulky to crochet over both. If you only do one strand, you can weave the other into your work when you are done. If you do both, then you wont have to weave any in later, but just make sure it turns out nice and neat! How does one crochet over a slip st (using the front loop only?) and tucking in the loose yarn? Hello! You won’t be able to carry the yarn in your work while you are working slip stitches. But you can leave the yarn end out and crochet over it later if you are working other stitches such as single crochet, double crochet, etc. in your work. I’ve been doing this technique for years, and it works well holding together through washing and what not. It’s not that it’s coming a part by no means at all. I have had a reoccurring issue come up after washing an item where the end I’ve woven in sticks out. It’s hard to explain to someone I’ve sold an item to how to trim them when they stick out. Is there anything else I can do to prevent those pesky ends from poking out?